C-SPAN recently aired two segments related to University of Lynchburg as part of the network’s 2018 Cities Tour. A C-SPAN crew visited the City of Lynchburg in January and spent several days filming sites and interviewing people about local historic and literary culture. Meanwhile, a C-SPAN representative made several presentations in University of Lynchburg classrooms. 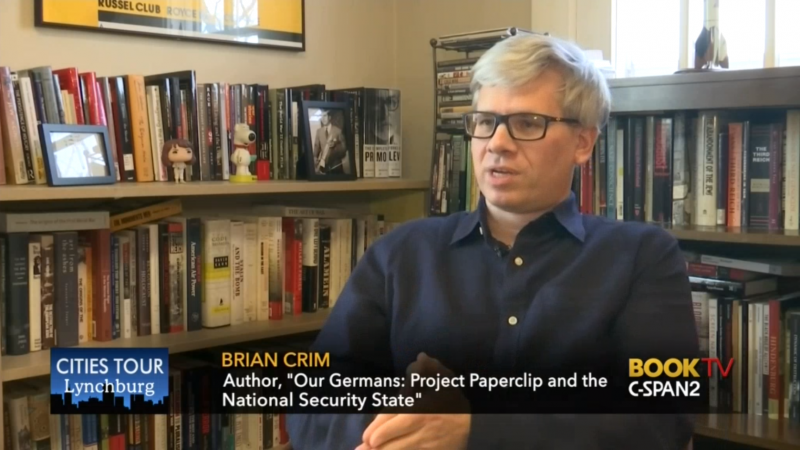 The crew interviewed history professor Dr. Brian Crim about his recent book, “Our Germans: Project Paperclip and National Security State.” Operation PaperClip, or Project Paperclip, was a secret government operation that evolved at the end of WWII. Realizing that German scientists had made breakthroughs in weapon technology, the United States secretly brought more than 700 ex-Nazi scientists into the U.S. to continue scientific work. Watch Dr. Crim’s interview with C-SPAN here. For more details about Dr. Crim’s books, read this December 2017 article. C-SPAN also visited Historic Sandusky and produced a segment about the home, which was used as the Union headquarters during the Battle of Lynchburg in the Civil War. Over the past 20 years, the Historic Sandusky Foundation has worked to restore the home to its Civil War-era condition and operate it as a museum. University of Lynchburg has owned and operated the site in conjunction with the foundation since 2016. Watch C-SPAN’s interview with Sandusky executive director Greg Starbuck ’14 MA here. C-SPAN’s videos about Lynchburg originally aired February 17 and 18. Watch other videos about the city here.